The Pioneer group recently celebrated their 50th year together. 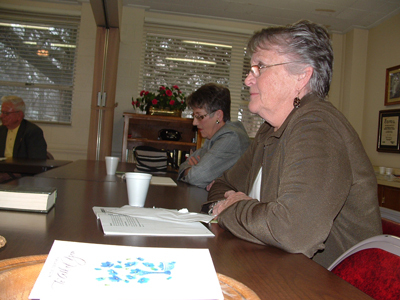 The class follows The Present Word lesson material, a Disciples of Christ publication. Each quarter includes lesson material from both the Hebrew Bible and New Testament. The class enjoys good times, both in study and in social events held throughout the year. The class focuses on discussion, with an emphasis on taking something from the lesson each week that will help the participants in their daily lives as they seek to walk with Christ. The class also focuses on ways to help others, dedicating time and energy to reaching out to neighbors with grace and love. Anyone is welcome to join in this quest for a closer walk with God. What is the Christian Church (DOC)? What to Expect When You Come?